Most leaks are preventable, but the damages done from a flood at home require expensive repairs that cannot be avoided. Repairs can range from a few hundred dollars to, in the case of a burst water pipe, as much as $70,000. Protecting your home from storms is also important. Just nine inches of water can cause nearly $19,000 in damages. A water heater can last for up to 12 years,2 but any sign of damage is a reason for concern. Rust is a clear sign water may be where it shouldn’t. A leak isn’t necessarily from a sudden failure; many leaks are slow and progress over time. Small amounts of water leaking over extended periods can trigger a slow-motion disaster of sorts. Hot water tank repair can prevent damage from the smallest of leaks. Flushing the heater annually removes sediment and minerals. 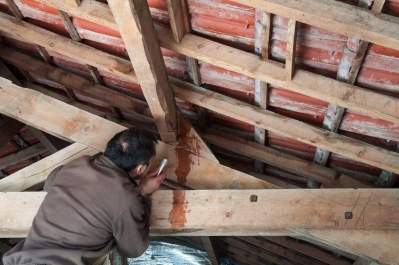 Buildup can cause damage and overheating, causing a leak. Regular maintenance by professional plumbers can, therefore, prevent such an issue. The slightest roof damage, even loose shingles, can lead to flooding. Water will find the path of least resistance, and, if ice gets in the smallest crack, it will expand and create an even bigger entry path. Any type of damage should be fixed immediately. Also, don’t neglect to unclog rain gutters and downspouts. Water might not only back up but also pool around the foundation and flood the basement. Leaf guards can help prevent a buildup of debris, while downspout extenders can direct water some distance from the house to prevent backflow. The tiniest of foundation cracks need to be fixed, as they’ll let water in and continue to weaken the structure. Just as hot water tank replacement will correct any leaks there, patching small cracks will stop water from penetrating your basement walls. Also, check that the soil grade surrounding your home isn’t angling toward the structure. Aggressive tree roots can also cause a problem and should be removed if threatening the foundation. Other sources of water leakage include kitchen sink taps, cupboard pipes, refrigerators, and garden hoses. A hose left connected to the taps over the winter can be a leak source. Either insulate the tap or install a cut-off valve or remove the garden hose entirely. Window wells in the basement can trap water; correcting the issue with well covers costs much less than flood repairs. For leak repair and home and appliance maintenance, you can count on plumbers from Speedy Plumbing. We offer a full range of plumbing services, including 24/7 emergency service. Call us at (604) 990-9735 to schedule a visit.